The Light Tank M3 was named the "Stuart" by the British after the American Civil War Confederate general J.E.B. Stuart. While many modern Americans have a frankly irrational disdain for the French military, Americans of the interwar period did not. France's defeat to Germany came as a shock to the American military, who realized that their own forces were even further behind France technologically. While the United States had always been interested in tanks, it was never willing to pay for a large armored force. That changed in 1940, and the existing Light Tank M2 (developed in 1935) was modified to create a serviceable light tank capable of supporting modern blitzkrieg style assaults. American tank designed believed (foolishly) in having tank destroyers to deal with enemy tanks, leaving American tanks free to engage enemy infantry. Thus the Stuart, despite being developed after the T-34, was equipped with only a 37mm gun. To make up for this, the Light Tank M3 carried at least four machine guns. The best features of the Stuart were its high speed and mechanical reliability. Its worst features were the all too common overtaxing of the commander (reloading the main gun, spotting enemy vehicles, issuing commands to the other crew members, using the radio, etc.) and its surprisingly short operational range. The Stuart's operational range was only 74 miles compared to 200 miles for the Crusader. The British classified the Stuart as a "light cruiser" tank, and were the first to use it in combat. It was used extensively in North Africa. By mid-1942 the allies had enough Shermans and other tanks to relegate the Stuart to reconnaissance duty, and it served in that capacity to the end of the war in the European theater. In the Pacific, theater, however, the Stuart served much longer a heavy combat tank due to the relative weakness of Japanese tanks. The Stuart has two good infantry attacks per round, great speed and decent armor for the affordable price of 15 points. It's important to note that the Stuart's value doesn't just come from these things individually, but also because they work very well together. 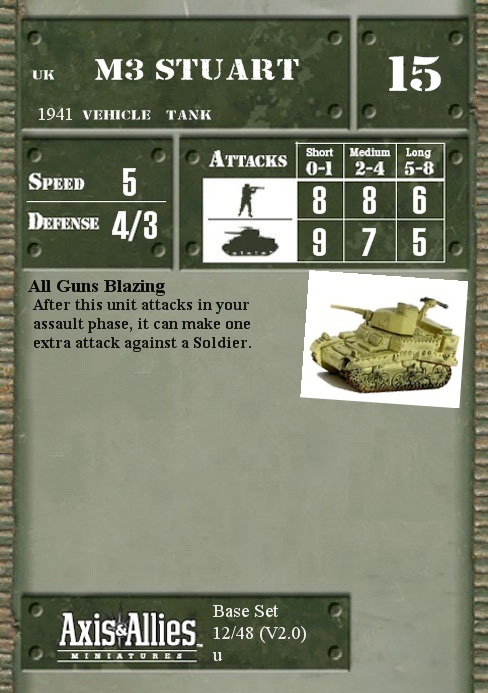 The Stuart's speed lets its evade anti-tank weapons and position itself where it can attack multiple infantry each turn, and the armor and speed combine to let you choose a range of engagement that either minimize the chance of your Stuart being disrupted or let you take a shot at an enemy's rear armor with the Stuart's admittedly weak antitank gun. I am not as fond of the Stuart as some other people because my opponent's Italian armies always have good options for dealing with it. But it is worth noting that even in that case I almost always get some good use out of the Stuart before it gets taken out by a Veteran Carro Armato M13/40, and I don't think I've ever regretted playing it. The Stuart is also one of those rare units that's just as good in 1945 battles as it is in early war battles. One final issue that I haven't mentioned much before in these reviews is the cost of acquiring minis. The Stuart is a great unit for players on a budget who don't want to spend a hundred dollars collecting multiples of a rare tank like the Valentine. The Stuart has been printed multiple times mostly as an uncommon, and is pretty easy to find cheaply.